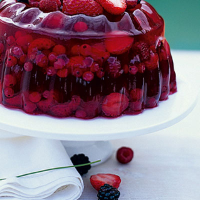 This fabulous jelly will be loved by adults and children alike. Set in one large mould, it's temptingly 'wobbly' rather than set firm, and can be served in individual glasses if you’d prefer. Immerse the gelatine sheets in a bowl of cold water. Leave to soften. Reserve 500g of the fruits and put the remainder in a saucepan, halving the strawberries if large. (Don’t bother to hull or string the fruits.) Add the lemon juice, sugar and 250ml water. Bring just to the boil, reduce the heat and simmer gently for 6-8 minutes until the fruits are soft and mushy. Put a large sieve over a bowl and pour the fruit into the sieve. Press the mixture through the sieve with the back of a spoon to extract all the juice. Discard the pulp. Thoroughly drain the softened gelatine from the water and add to the hot fruit juice. Stir until dissolved, then add the balsamic vinegar. Leave until cool and beginning to thicken. Hull the reserved strawberries and cut into quarters. Run the currants through the tines of a fork to remove the stems. Rinse out a 1.5 litre metal, glass or plastic jelly mould but don’t dry it. Pour a third of the purée into the mould. Scatter with a third of the fruits and chill until the jelly is very lightly set. Ladle over half the remaining purée and scatter with half the remaining fruits. Chill again until beginning to set. Add the remaining purée and fruits and chill overnight until firm. Unmould the jelly just before serving. Half fill a bowl that’s larger than the mould with very hot water. Dip the mould briefly in the water then lift out and invert the serving plate over the top. Invert the mould and plate and gently shake both until you hear the jelly loosen onto the plate. Decorate with extra berries. Serve with pouring cream or clotted cream.